Anyone curious about the roots of Apple's status as the first trillion-dollar company would be well advised to pick up this book. Kocienda, former principal engineer of iPhone software for Apple, ably explains the company's development philosophy through a series of vignettes covering the creation of the Safari web browser and the design of the on-screen keyboards for the iPhone and iPad. Starting by listing "seven essential elements to Apple's software success" (including collaboration, decisiveness, and taste), Kocienda immediately cautions the reader that "there weren't any signs affixed to the walls of our Cupertino campus exhorting us to Collaborate!' On the contrary, we felt, on an instinctive level, that a fixed methodology might snuff out the innovation we were seeking." This flexible approach, Kocienda shows, was key to the success of Apple's tightly integrated combination of hardware and software. He also emphasizes Steve Jobs's insistence that the company "make extremely advanced products from a technology point of view, but also have them be intuitive, easy to use, fun to use, so that they really fit the users." Kocienda's account of how, painstakingly, this goal was achieved will be of deep interest to software engineers as well as the casual computer buff keen on gaining insight into Apple's unprecedented success. If you create anything, this book has something to teach you. I am something of a computer history junkie having read many books on the subject. The soul of a new machine remains my favorite. 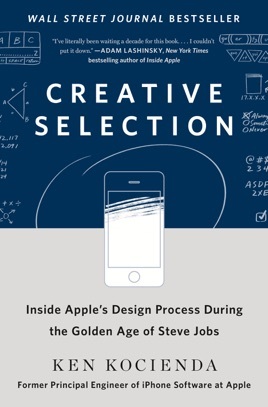 This book will have appeal to anyone who is a fan of apple devices. Just as the fifties and studies are often thought of as"rocking" decades, I believe we are now in a smartphone decade with a new kind of interpersonal connectivity. This book provides some insight as to how the foundation was laid. For me Kocienda's thoughts about creativity are important as well. I suspect we are moving from the era of the smartphone to the era of artificial intelligence. One test for Associates intelligence will be the ability to be creative. Kocienda illustrates three elements of creativity: 1) recognition of a problem to be solved; 2) assembly of potential solutions from the parts and ideas at hand, and 3) choosing the best solution based on standards that can be referred to as taste. I hope I am not misrepresenting his idea. It seems a way to move towards role based creativity of that isn't an oxymoron.